Boxwalla enthusiasts know that their green beauty boxes are an extraordinary value, and that the products themselves are nothing short of spectacular. Their carefully curated beauty boxes are a tremendous value, with steep discounts, and they feature truly covet-worthy luxury organic beauty products. The Boxwalla February Beauty Box Moonlight & Silver Sleep ($49.95 and $59.95 for a one-time purchase. 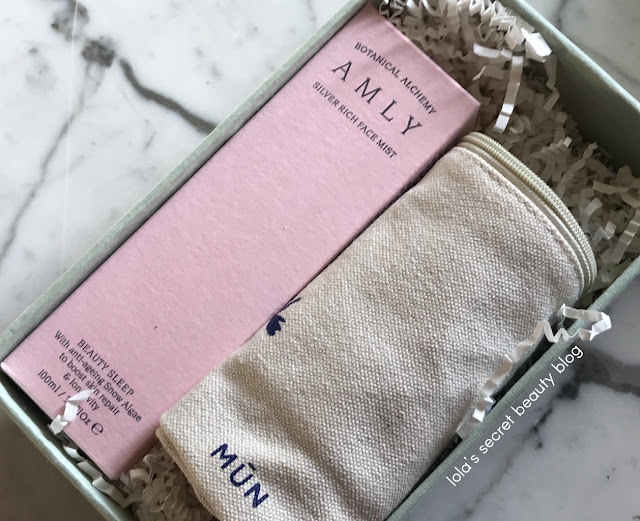 Retail value $165.00) features two full-size products from MŪN Skincare and Amly Botanicals– that will whisk you into calming nights of soothing bliss. 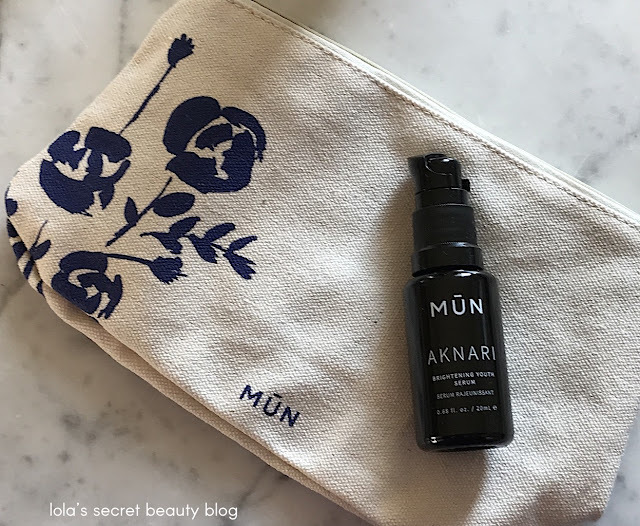 MŪN Skincare Aknari Brightening Youth Serum (Full size. 0.67 fl oz. for $95.00): This oil-based antioxidant-rich face serum is such an immense treat to use. It is a lightweight and fast absorbing luxury oil comprised of Prickly Pear Seed Oil, Argan Oil and Bulgarian Rose Oil. Rich in linoleic acid, phytosterols, Vitamin E, Zinc and Vitamin K, this elegant certified organic serum deeply nourishes and moisturizes the skin– leaving it soft, smooth, supple and luminous. Furthermore, it smoothes fine lines, it lightens sun spots, calms irritated and inflamed skin and stimulates collagen production. Its heavenly aroma, primarily the result of the Bulgarian Rose Oil, is both luxurious and calming. Boxwalla has included a wonderful MŪN cosmetic bag in their February box! The stunning results of this lightweight age-defying serum are due to the potency of Prickly Pear Seed Oil. Extremely rich in Linoleic Acid and super antioxidant Vitamin E, Prickly Pear Seed Oil combined with Argan Oil works wonders to smooth wrinkles, repair sun damage and lighten dark spots. The protective serum also soothes inflammation, brightens under eye circles and stimulates collagen production. Bulgarian Rose Essential Oil aids absorption and provides a heavenly scent. In tandem, these three oils leave your skin feeling soft and looking radiant. Effective for all skin types as a day, night and under-eye treatment. Prickly Pear Seed Oil: "Has traditionally been used to protect and heal the skin from the harsh and burning desert wind in Southern Morocco. One of the most precious plant oils in the world, 1,500 lbs of Prickly Pear fruit is needed to produce 1 liter of the rare oil. Exceptionally rich in Essential Fatty Acids and Vitamin E, a natural antioxidant that helps protect the skin from free radicals. Its inherent anti-aging benefits help reduce the appearance of fine lines and prevent premature wrinkle formation." Argan Oil: "Moisturizing and revitalizing properties restore the skin's barrier while neutralizing free radicals, making it ideal for daily skincare. Suitable for all skin types, it possesses anti-inflammatory properties that diminish the redness caused by enlarged capillaries in the skin, making it the perfect treatment for acne and sunbathed skin." Bulgarian Rose Oil: "Abundant in Vitamin C antioxidants, featuring rejuvenating properties that soothe while promoting a bright, silky, even-toned and radiant complexion." Ingredients: Prickly Pear Seed Oil* anti–aging, brightening, antioxidant Argan Oil* antioxidant, moisturizing, anti–aging Rose Flower Essential Oil antibacterial, antioxidant, smoothing *Certified Organic. Amly Botanicals Beauty Sleep (Full size, 3.4 oz. for $70.00): Beauty Sleep, while a spray mist, functions like a hydrating serum– which was specifically formulated for nighttime use. Its purpose is to enhance and further stimulate collagen production and cellular repair while sleeping. Filled with trace minerals, this spring water is, "unusually rich in naturally occurring silver salts that are highly bio-accessible. Silver is a very powerful antioxidant, helping fight free radical damage." Ingredients, such as Echinacea, calm irritated skin and help to smooth fine lines, while the essential oils from Clary Sage, Roman Chamomile Neroli, Jasmine, Rose Otto Frankincense and Linden Blossom calm the senses and nourish and calm the skin. The intoxicating aroma, which is an amalgam of the its aromatic ingredients, is calming and relaxing, and therefore so well-suited for a nighttime skincare treatment. Beauty Sleep nourishes, hydrates and pampers the skin while you sleep, and when you awaken skin appears refreshed and rejuvenated. A restorative face mist with powerful ingredients to support natural healing sleep. Fatigued skin will crave a nightly spritz of Amly’s unique silver-rich spring water, laden with rejuvenating botanicals reputed for their beautifying and soporific properties. A star ingredient, Snow Algae activates overnight collagen production and cellular repair to ward off signs of aging by boosting the skin’s longevity. Extracts of Passionflower, Valerian and Hops help relieve tension, while essential oils of Clary Sage, Linden and Roman Chamomile quiet the mind and soothe away the day’s stress. Rose Quartz, Benzoin and Rock Rose imbue warmth and provide comfort, while Echinacea calms irritated skin and smooths fine lines. A deep foral scent, with earthy sweet notes, Beauty Sleep is infused with sublime floral waters of Neroli, Lavender and Geranium to indulge the senses and replenish the skin. The perfect bedtime ritual. Directions: Shake well before each use. Close your eyes and spray liberally on to face, neck and pillow. Breathe deeply to allow the soothing oils to appease the senses, release tension and induce sleep. Ingredients: Aqua, Citrus Aurantium Dulcis (***Sweet Orange) Flower Water, Rosa Damascena (Rose) Flower Water, Anthemis Nobilis (Roman Chamomile) Flower Extract, Lactobacillus Ferment, Aloe Barbadensis (***Aloe Vera) Leaf Extract, Glycerin (Vegetable), Brassica Campestris (Rapeseed) Seed Oil, Achillea Millefolium (Yarrow) Flower Extract, Hypericum Perforatum (St John’s Wort) Leaf Extract, Alchemilla Vulgaris (Lady’s Mantle) Leaf Extract, Hibiscus Sabdariffa (Hibiscus Berry) Flower Extract, Vaccinium Myrtillus (Bilberry) Fruit Extract, Crataegus Monogyna (Hawthorn Berry) Fruit Extract, Sambucus Nigra (Elderflower) Flower Extract, Althaea Officinalis (Marshmallow) Root Extract, Equisetum Arvense (Horsetail) Extract, Hydrolysed Hyaluronic Acid, Bis (Tripeptide-1) Copper Acetate, Pisum Sativum (Pea) Peptide, *Citrus Aurantium (Neroli) Flower Oil, *Tilia Cordata (Linden) Flower Oil, *Rosa Damascena (Rose Otto) Flower Oil, *Boswellia Carteri (Olibanum) Gum Oil, *Jasminum Grandiflorum (Jasmine) Absolute Flower Oil, *Matricaria Chamomilla, Glucose, Benzyl Alcohol, Selaginella Lepidophylla Extract, Polyglyceryl-4 Caprate, Silver Citrate, Citric Acid, Dehydroacetic Acid, **Limonene, **Linalool, **Geraniol, **Citral, **Farnesol, **Citronellol, **Benzyl Benzoate *Natural Pure Essential Oils **Potential Allergens ***Certified Organic Ingredients. 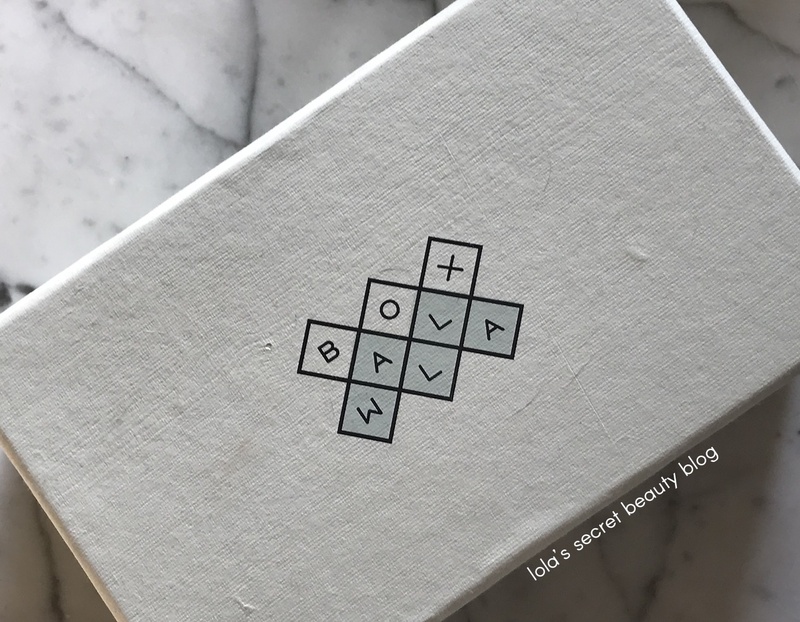 Overall Assessment: The Boxwalla February Beauty Box Moonlight & Silver Sleep is a real treat to the skin and the senses, and it is an extraordinary value that costs a mere fraction of the retail price. My suggestion is to get yours before they are gone, you won't regret it! Boxwalla also has a few other non-renewing one time options that allow people to purchase the box at the same price as subscribers, that is, at $49.95. These make great gifts since they do NOT auto-renew. These are multi-cycle options that will start with the February Box (till they sell out). Prickly Pear is such a wonderful skincare ingredient! I love Bulgarian Rose as well, and it smells intoxicatingly good! Boxwalla is ultra-luxe, and such an amazing value for first rate green beauty brands! This is a very impressive box. The brands they choose are unique and quite high quality. While the scents wouldn't agree with me I can't deny that the box is fabulous. It really is an ultra-impressive eco-luxe box! You just can't go wrong with Boxwalla, and the value is extraordinary. 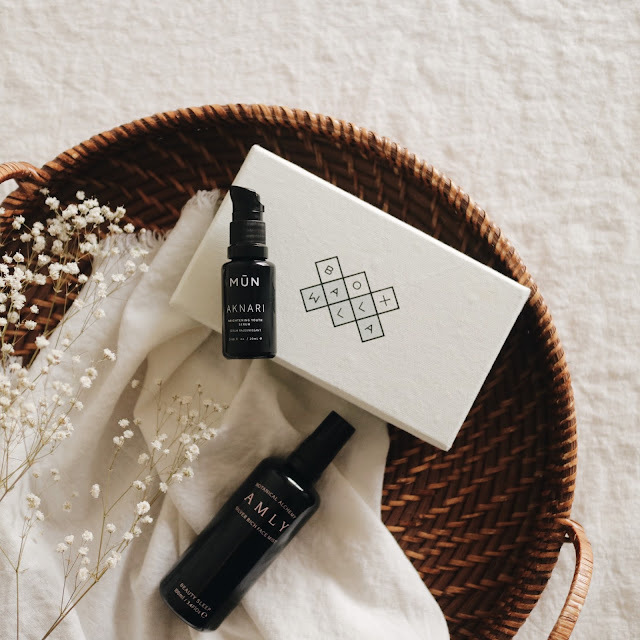 I think that you could definitely use many of the products that Boxwalla selects for their green beauty boxes, but the more fragrant natural aromas would need to be tested to see whether they triggered your sensitivity to scents. It absolutely is, and it never disappoints! Skincare lovers would flip for this box! Love the green beauty additions! COMPLETELY! 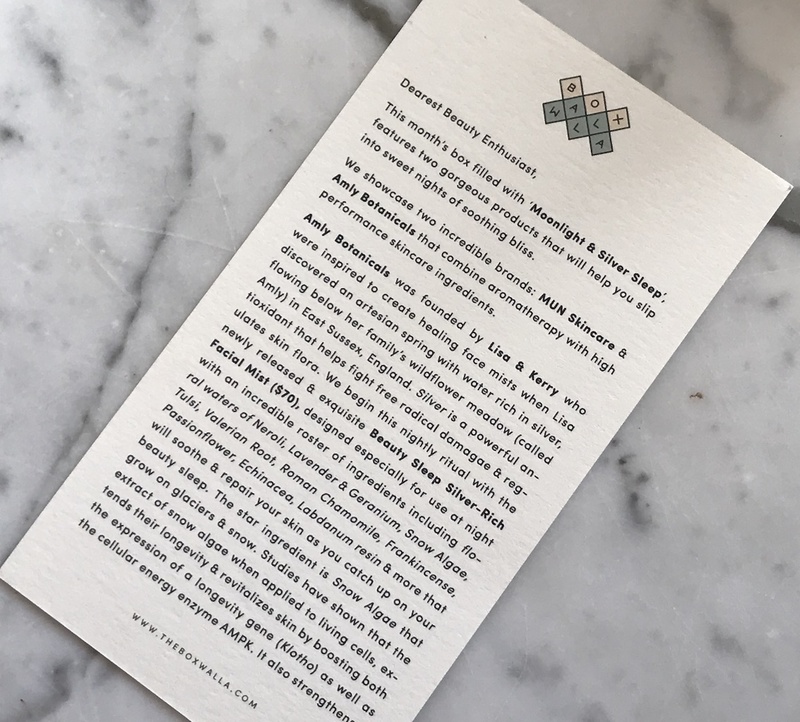 Their carefully curated selections are always an extraordinary treat! The face mist sounds aweeesome for a little refresher! It is a really wonderful nighttime treatment! I'm pretty obsessed with it, actually! I haven't heard of Boxwalla before! Thanks for introducing them to me. I think I might pick up a one off box to give it a try before deciding if I want to subscribe. It is the most amazing eco-friendly beauty box, Cassie! It is definitely worth trying their boxes! I highly recommend! Such an unusual box with unique products! 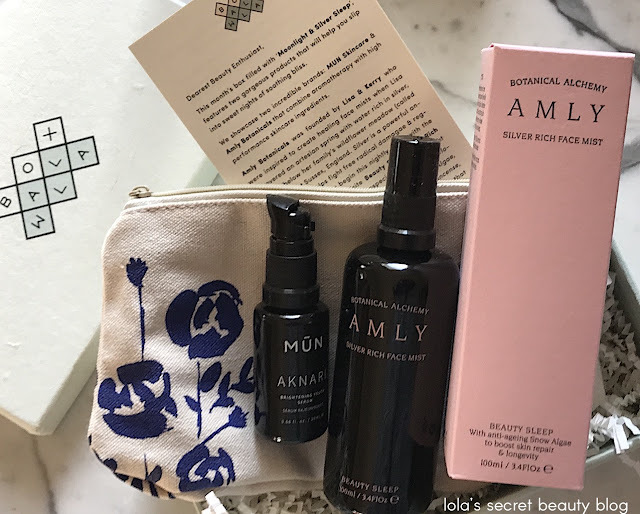 They never fail to delight in their first rate, beautifully curated eco-luxe beauty boxes!